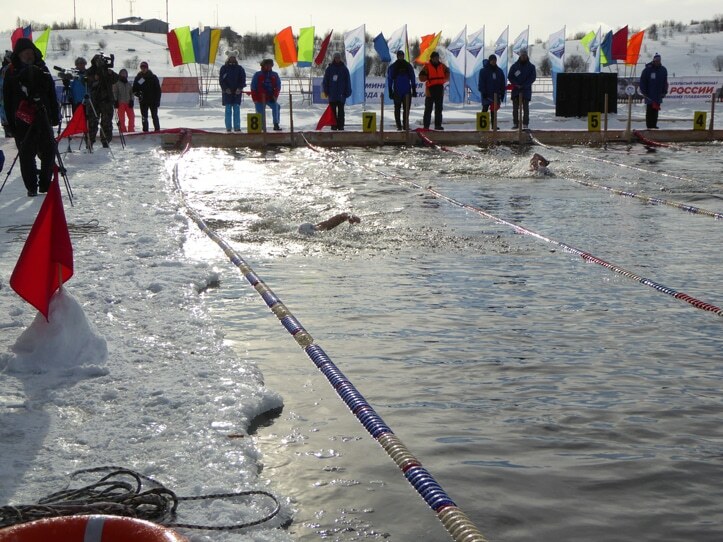 Following the World Ice Championships, GB and all of the other visiting teams stayed on in Murmansk to compete in the Russian Winter Swimming Championships. This is a series of short races of 25m and 50m Breaststroke and Freestyle and a longer endurance event of 450m. The competition, now in its 10th year, attracts competitors from all over Russia. Around 500 swimmers, representing some 50 clubs and cities, had gathered to take part. We were much more relaxed than we had been for the Ice kilometre event as the longest event was less than half the distance that we had already completed. However, overnight there had been further heavy snow and early morning air temperature was recorded at -18 degrees. Thankfully the clouds cleared and the competition got underway in bright sunshine! The shorter distances are not our forte, but we both managed to achieve podium positions in all four of the sprint events. Kate took silver in the 50m Breaststroke and bronze in the other events. I managed to secure gold in the 50m Freestyle and bronze in the other sprints. The final event, late in the afternoon, was the 450m ‘endurance’ event. Kate swam first and had an excellent swim, achieving first place in a time of 7:42.75. My swim was not so well executed. Swimming late in the afternoon, I had a setting sun to contend with, which made sighting the end of the pool very difficult. I swam into the lane ropes and managed to swallow a mouthful of the frigid water. This was something I had been anxious to avoid as it can accelerate the chilling process. My hands, which had not completely recovered from the 1km swim two days earlier, went numb before the halfway point. But again the sight of my competition struggling in the adjacent lanes, gave me a boost in the closing stages. I finished in a time of 6:01.70 to take my second gold medal of the competition. With three gold, one silver and six bronze medals, GB finished second behind Russia out of the 16 nations represented in what was a thoroughly enjoyable and memorable swimming festival.